In the last blog we have discussed the impact of Payroll Input Data on the payroll outcome, and explained if there are errors in the Payroll Input Data, the payroll process outcome will not be correct. In this blog, I shall explain why it is critical to have a Trial (Simulated) Payroll Process. The Trial Payroll (TP) Process enables the user to run the payroll in a simulation mode and to review the outcome of the payroll including the payroll register, pay slips, direct bank deposits, and payroll JV journal. And if the payroll process outcome is incorrect, the user can go back and make any required corrections to the Payroll Input Data, and rerun the payroll in a simulation mode again. And this trial payroll process run will continue until the desired payroll outcome is achieved. The objective from the Trial Payroll Process is to ensure that the outcome of the payroll is 100% correct before releasing the paychecks. It is an important and critical tool as it provides the user with an effective payroll verification instrument that facilitate the task of verifying and auditing the payroll outcome without having any impact on the final payroll. Trial Payroll is the same as the Final Payroll. The only difference is that the Trial Payroll enables the user to run the payroll process as many times as required to verify the payroll outcome, while the Final Payroll can be run only one time. The benefit of Trial Payroll is that the user can verify the payroll outcome (Gross-to-Net), and if there are any errors, the user can check the cause of the error(s) and correct the payroll input data and rerun the payroll to ensure that the outcome of the payroll is 100% correct before running the Final Payroll. While the Final Payroll, does not allow the user to run the payroll more than once. Once the Final Payroll is executed, the user cannot go back and run the payroll again. 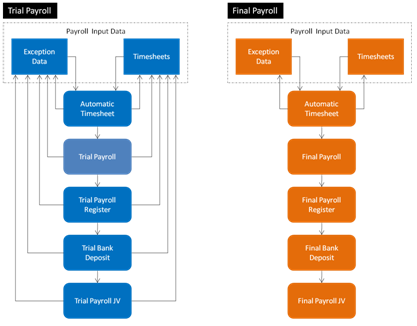 As shown in figure-1, the Final Payroll can be run one time only, while the Trial Payroll can be run many times. Assume that you run Trial Payroll, followed by the generation of the Trial Payroll Register, then you verify the trial payroll register and found that two employees’ Gross-to-Net is incorrect. On further analysis/investigation of their payroll detail calculation, you find that their overtime hours were incorrectly recorded in their timesheet. So, you go back and correct their overtime hours in the timesheets, and rerun the Trial Payroll, and regenerate the trial payroll register, and then verify the Gross-to-Net of these two employees and find that their net pay is correct after the corrections made in the timesheets. On the other hand, if you run the Final Payroll directly, then the Final Payroll Register, and find that two employees have incorrect net pay, and the reason is their overtime hours, you cannot go back and correct their timesheets. The outcome of the payroll is never 100% correct on the first try. And the reason for this is that the Payroll Input Data will always have errors including errors in data entry and/or omission. Having said that, the user needs to be able to run the payroll many times over to verify and correct the Payroll Input Data. If we do not have a Trial Payroll Process, and we can only run the Final Payroll, then it is impossible to produce a correct payroll. The Trial Payroll is important and critical to produce a 100% correct payroll. Interact HRMS provides a compressive payroll (Interact Payroll) system that is fully and seamlessly integrated with HR Core, Leave and Time Management, Expense Management, and other modules. Interact Payroll supports four types of payroll: (1) Normal Payroll Cycle (NPC), (2) Off-Cycle Payroll (OCP), (3) Retroactive Payroll (RP), and (4) End of Service Payroll (EOS). Interact Payroll provides a comprehensive Trial Payroll that mimics what the Final Payroll does, while enabling the user to run the payroll as many times as required until the correct payroll outcome is produced. Interact Trial Payroll includes Trial Payroll Process, Trial Payroll Register, Trial Payroll JV, Trial Payslips, Trial Payroll JV Report, and Trial Direct Bank Transfer. So the user can run all payroll processes and associated reports as many times as required in a trial mode, and enables the user to conduct the required verifications, and identify and correct any errors in the payroll input data. Once the outcome of the Trial Payroll is 100% correct, then the user can run Interact Final Payroll. With this approach, your organization will always produce an accurate payroll.